Sprachtrainer Step 3: How do I submit my vocabulary list to Prof. Block? You have now done your assigned reading for the past three class periods, organized your vocabulary lists, and have studied the 60 words. Now you should electronically submit your list of these most recent 60 words to Prof. Block. Click on “Trainer” link at the top of leo.org. 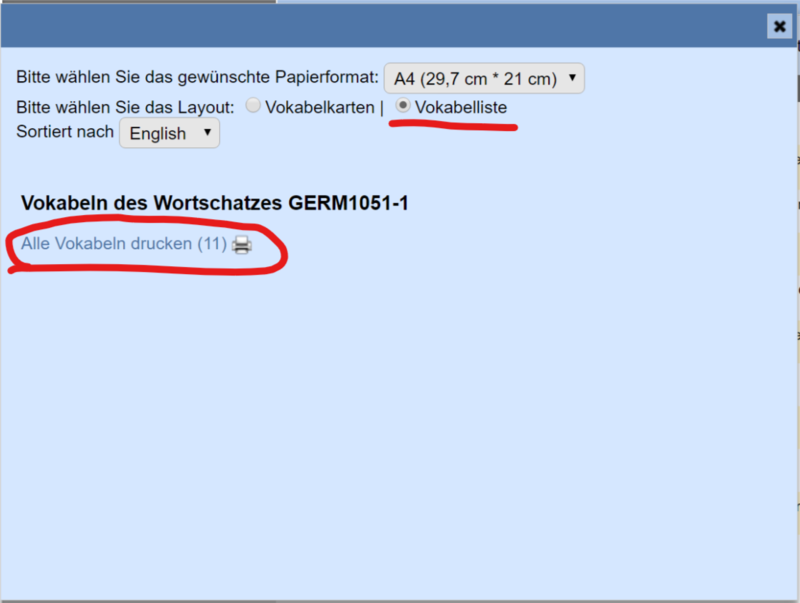 Ideally, you will have a list of vocabulary that has been sorted via the checkboxes into different columns–“Liste 1”. Each list will have 60 words in it. To submit a PDF to send electronically of the most recent 60 words, click on the name of the list you want under “Edit Word Lists”. Then click on “Print (PDF)” at top. On the next screen, select “Alle Vokabeln drucken”. You can also print flashcards to cut out and use on your own. The PDF that you submit should have all 60 words on one document, approximately 3 full pages. Save the PDF file with your last name. Submit the PDF that is created to Prof. Block through the course website.